PS- I used some silicone muffin cups for the first time. NOT recommended in case you were wondering! I scored a whole stack of heart shaped ones for a buck at Goodwill at thought it would be fun, but instead of getting heart shaped muffins I have blobs in muffin liners that need to be washed (lame!) I do, however, 100 percent recommend buying a few Silpats to line your baking sheets. No more burned cookies or muffins, easy clean up, a million uses- I can't say enough about these things. Love my silpat. Pretty muffins. Can't wait to see those cupcakes! Yummy muffins! Great job! I love my silpats. Don't bake without them anymore! I used the silicone muffin cups too, they are the best! Orange muffins sound amazing! I totally agree with you on the silicone muffin cups -- I don't get it! Ugly muffins and more mess? No thanks! Great job anyway! Thanks for the silicone review, I wondered about them. I wanted to try orange but the lemons just spoke to me! Next time. I love these muffins. Have a great day. I'll have to try these with orange, too! My husband bought me some Lego shaped silicone pans a few years ago and I've never been able to get anything out of them in one piece. Yep, there's nothing like a good muffin. Sometimes that's all one really needs. 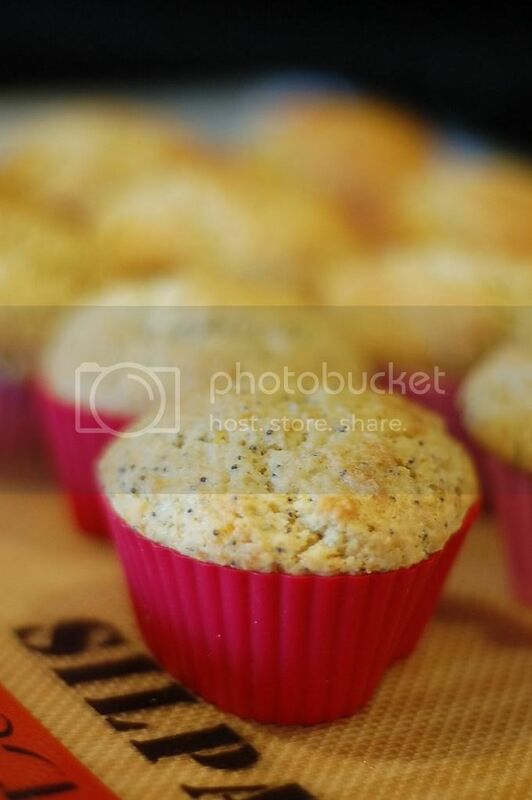 These orange poppy seed babies look just perfect to me. Adorable! my silicone cups are hit n miss... i find the muffins dont get brown enough with them... they always look a little washed out. i wonder what i'm doing wrong. Thanks for the tip on the silicone muffin pans! Your muffins look delicious! I'm crazy about oraneg poppyseed bread! Yum! If you can believe it I have yet to bake a poppyseed muffin... I think it's a sign that I need to make these. Thanks for baking with me this week, they look great! I've been on the fence with buying silicone liners, now I know I am not missing anything, thanks!